Entering the offices of Ligon & Ligon DDS feels more like stepping into someone’s home than stepping into a dental practice. Amid the expected degrees, certificates of achievement and news clippings that adorn the walls are more personal mementos and artifacts: family photos and portraits; a Lakewood High School basketball jersey (No. 24) from Dr. Brian Ligon’s tenure leading the team to win the state championships in 2002; a Butler University jersey (No. 24) from the 2007 Sweet Sixteen Tournament; a 101-inch blue marlin, stuffed and mounted over the reception desk (caught by Dr. Reginald Ligon during a fruitful fishing trip to the Bahamas). The atmosphere is instantly warm and welcoming, reflective of the family who has operated their dentistry practice here for more than three decades. “We’ve got jerk chicken for lunch, would you like some?” Mendee asked me during a pause in our conversation. Though we chatted during the practice’s lunch break in the Ligon’s office, she put me at ease almost immediately with her easy-going manner and welcoming charm. Her son, Brian, proved equally likeable—good-natured, confident and polite—and I could see why patients have remained loyal to both. Not only is dentistry in Brian’s blood, but he’s learned from the best. His father, Dr. Reginald Ligon, moved to St. Pete after he graduated from dental school in the mid-1970s to help run the practice that his brother, Dr. Julius Ligon, had opened. He settled in the city even after Julius passed away, remaining here with Mendee after they married and she’d completed her own dental residency in 1980. A mere two years later, they were already considering an expansion and eyeing a place across the street. “It was an abandoned building, but the city was encouraging people to take over properties, the parking was better and the facility was larger,” Mendee said. They moved into the newly renovated Central Avenue building in 1983 and still manage the business from that location today. It’s an attractive place to raise a family. The climate is good and the cost of living is well below the national average. She also pointed out the area’s responsive denizens, bounty of churches and endless opportunities to establish a presence within the community. Mendee and Reggie have established strong ties in St. Pete’s South Side—Dr. Reggie served as president of Baypoint Little League for a decade and played an instrumental role in facilitating the installation of new baseball fields and the 31st Street Sports Complex. As for their presence within the rest of the city, Mendee served on the YMCA Board during its new building campaign and was also a member of SPC’s Dental Hygiene Advisory Board for a number of years. Dr. Reggie also took park in the St. Pete Chamber of Commerce’s Leadership St. Pete program (geared at promoting and enhancing community leadership) and acted as President of the Suncoasters (a civic organization comprised of business leaders who produce events in support of art and music programs in St. Pete, like St. Petersburg Festival—a month-long arts festival held all around St. Pete). The fine culinary offerings are also a draw—Engine No. 9 for burgers, The Hurricane Restaurant for seafood (“It’s always been a family favorite”), chicken and waffles at Rush Hour and Taqueria for Mexican. Not to mention the vast array of cultural diversions and leisure activities, from museums (“I go to the Dali a lot”) to concerts, including a particularly memorable one at the scenic waterside Mahaffey Theater, where Mendee received a personal serenade from Chaka Khan. But, it’s not just about the entertainment. All three of Mendee and Reginald’s children grew up in St. Pete. Their oldest daughter, Shannon, is now an attorney. Their youngest daughter, Evan, is completing a Masters degree at Florida International University, and their son, Dr. Brian, is carrying on his parents’ dental legacy. While his parents inch toward retirement, Brian is ramping up his game. Surprisingly, he didn’t set out to become a dentist. Dentistry was always presented to Brian as an option, not an expectation, so he had no prior experience working in his parents’ office, nor any preconceived notions for or against it. But his interest was sparked after shadowing a periodontist and witnessing the doctor perform complex procedures. He went on to study at Meharry Medical College in Nashville (the Alma mater of both of his parents) and earned his Doctorate in Dental Surgery in 2011. His decision to return to St. Pete was a no-brainer. “Coming in and seeing the relationship my parents have with their patients, not only in the practice, but outside of the practice in the community, and getting to learn the ins and outs of operating a business from them—as well as managing a private practice—it was the right decision for me,” remarked Brian. Like his parents, he chose to remain and raise a family here with his dentist wife, Dr. Erika King Ligon. They too enjoy the area’s abundance of offerings—concerts, the Museum of Fine Art, Rays baseball games at Tropicana Field, boating and fishing. “I like walking around downtown. It’s been built up so much; it’s a lot more lively than when I was in high school. They have a whole strip of nightclubs and lounges. I think it definitely makes it more appealing to younger professionals like myself, as far as getting out in the city and patronizing those places,” Brian said. 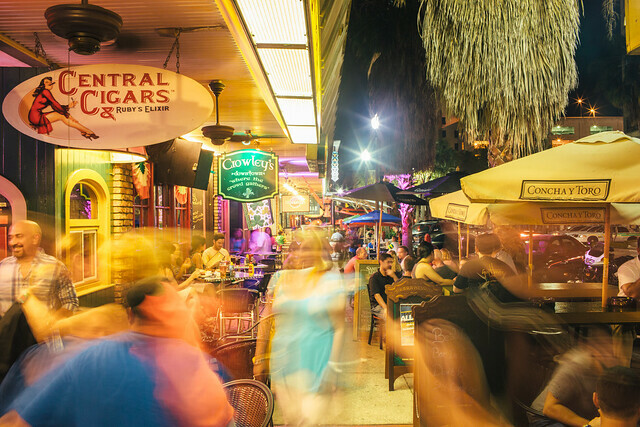 Learn how St. Pete can become your Sunshine City, where small business life thrives. Discover the St. Pete lifestyle and why residents keep saying, “You’re my Sunshine City”.